LifeJournal offers computer and mobile device friendly tools for keeping a searchable, interesting and useful journal. 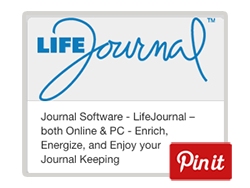 Visit LifeJournal.com for information on this software, which is available for journal keeping on the cloud or directly on Windows machines. After you buy the software, you can buy add-on prompts and tools under many categories. Visit here to explore those categories. Writing, for which Sheila Bender wrote content, is at the top of the list! You can learn more about my work on this here.